This is a free seminar to help solve car financing problems because of a low credit score. Weiss Toyota, Prestige Financial, St. Louis Community Credit Union and the Licker Law Firm, will be present to answer all questions about how to optain a loan for car financing. The seminar will be on Wednesday Evening, January 25, 2012, 6:30pm to 8:00pm at the Marriott Hotel, St. Louis Airport, 10700 Pear Tree Lane, St. Louis, MO 63134. 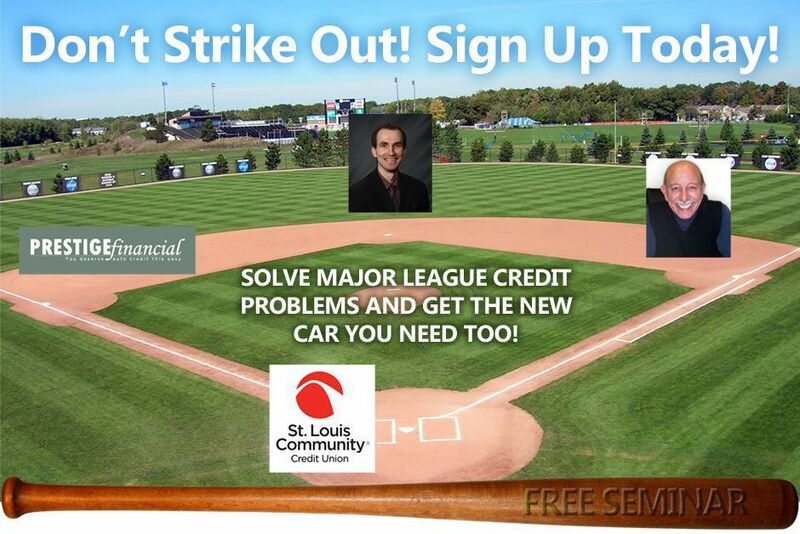 Free Seminar to Help Solve Car Financing Credit Problems. Let Our All-Pro Team Show You How To Tag All The Bases As You Get Home SAFE And Score With A New or Pre-Owned Car! A specialist in bankruptcy filing and client counseling.